What are the eligibility criteria for a CREST Scholarship award? How can I begin the application process now? All applicants must first apply for Federal Student Aid by filling out the Free Application for Federal Student Aid (FAFSA). The FAFSA is made available free of charge by the U.S. Department of Education for the purpose of applying for federal and state student grants, work-study, and loans. To obtain a FAFSA, please visit www.fafsa.ed.gov. The FAFSA will provide a Student Aid Report (SAR) that will be needed to complete the CREST Scholarship application. Students will need to prepare a personal essay for the CREST Scholarship application. Students may write this in MS Word and copy/paste to the online application or type directly into the application forma online. Essays must be 500 words or less and include information that you believe the committee should know as they consider your application. Your future educational and career goals must be included. You may include academic or personal achievements, leadership skills and experience, community and school participation, and financial obligations. Online application sessions are announced and open in the spring for the academic school year beginning in the fall. 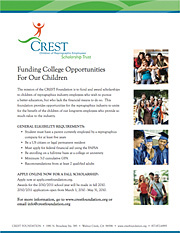 Application are available on the CREST Foundation website. Applicants must complete the online application with his/her personal details/information. Parents/Guardians are not permitted to complete the application on behalf of a student. Any applicants who are under the age of 18 must have a parent/guardian sign the application once it is complete and ready for completion. Will I be allowed to edit my application once I have begun the process and submitted certain sections? Yes, your application will be editable if you select "submit" or "save." As long as you do not select the "complete" option, you may edit your application. Once I've completed my application, may I go back and make changes? No. Once you have completed your application, you may not edit any details. It is extremely important that you verify all the details you enter into your application especially the email addresses of your references, financial aid officer, and parent/guardian's employer PRIOR to completing your application. Careful attention to detail is a part of the application process. What if I am still awaiting acceptance to the college/university of my choice? We are only able to accept applications with verifiable enrollment for the fall semester. What if one of my references fails to complete his/her portion of my application? Part of the application process includes arranging and following up with your references to complete their portion of your application. References often have hectic schedules. It is your responsibility to ensure they complete their reference for you in the allotted time. If they do not complete your reference, your application is considered incomplete and cannot be submitted for consideration for a CREST scholarship. How do I know if my parent's employer is a member of the IRgA? The CREST Foundation will verify the membership status with the IRgA. Students will only be responsible to enter the name of the employer. When will I be notified whether or not I have been selected as a CREST Scholarship recipient? You will receive an email notification in the fall indicating that you have been selected as an awardee. All applications must go through a review process that is based on academic achievement, financial need, leadership qualities and personal strengths/achievements. Following the review, certain information must be verified, including proof of full-time enrollment status, SAR report, and reprographic industry employment by a parent. All scholarship award recipients will be asked to accept their awards. The funds will be disbursed this fall once all have been accepted and information is verified. If I've already received a scholarship may I reapply in the next session? Yes, you may reapply for the next session. If I did not receive a scholarship may I reapply in the next session? What happens if I do not maintain a 3.0 GPA? If you do not maintain a 3.0 GPA, the CREST Foundation will not be able issue the second installment of your scholarship payment. What happens if I do not maintain a full course load of 12 credits or more? If you do not enroll for a full course load of 12 credit hours or more, the CREST Foundation will not be able to issue the second installment of your scholarship payment. What if I am on a quarterly schedule and not a semester schedule? As long as you are able to verify that you have maintained a 3.0 GPA for your last quarter and register for a full course load of 12 credit hours or more for the upcoming quarter, you will receive your second installment.